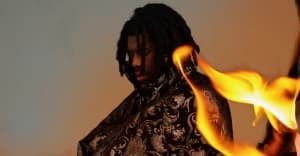 The film, which marks Flying Lotus’s feature-length directorial debut, premiers at Sundance this month. Ahead of the premiere of Kuso at the Sundance Film Festival this month, Flying Lotus has shared the official poster for his feature-length directorial debut. The film is expected to be a mind-bending experience and the poster doesn't disappoint, featuring the warped heads of cast members such as Flying Lotus himself, Hannibal Buress, Tim Heidecker, and Zack Fox. According to the Sundance synopsis, Kuso is a post-apocalyptic story, "broadcasting through a makeshift network of discarded televisions...tangled up in the aftermath of Los Angeles's worst earthquake nightmare." The film will feature original music from Aphex Twin and FlyLo. See the poster for the film above.